This blog is about my main interests: communication, the orthodox belief, translation and music. I would like to share with you the simple way of saying/writing things about what we love most in life. I have a Bachelor degree in Geography and English Language and a MA in Communication and Public Relations from David Ogilvy College of Communication and PR, Bucharest Romania. Presently, I work as Online Marketing Manager for Bio Careers, the leading online career service for life science post graduates in the U.S. Sometimes I blog, but not so frequently. 😉 This is more like a hobby, having no commercial intention. 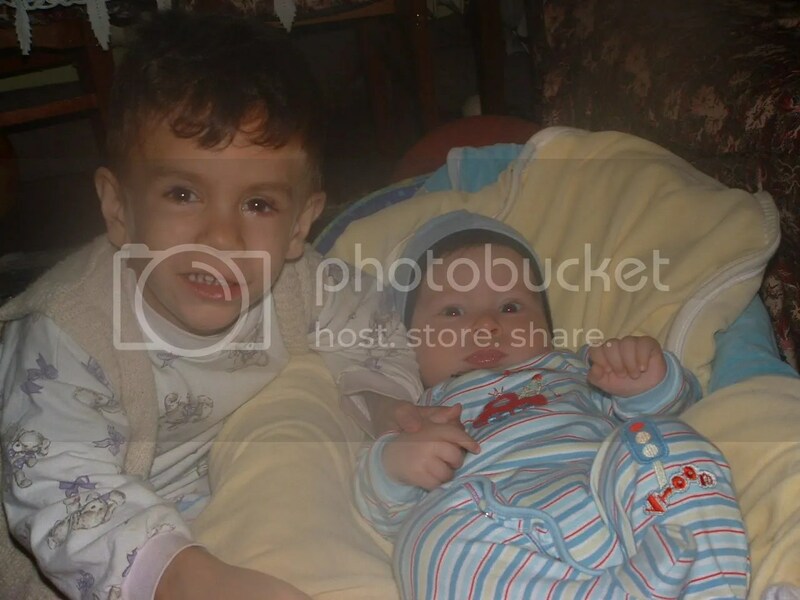 I have two wonderful boys, Teodor and Horia Andrei. They are the light of my eyes. My husband is a general surgeon. a friend of mine gave this adress where i could find out exactly what i have to do in order to become an authorised translator. thank you very much for the information! i’m happy to see that we have some things in common: we are both English speakers, Orthodox believers and we both have 2 wonderful boys; (i also have a girl) Andrei-3,1/2 years old, Ioana-2 and Teodor-1. i wish you a good year and God help us all! Thank you very much for your kind wishes. It seems that we both chose quite the same names for our baby boys, Andrei and Teodor, that is nice. I wish you good luck with obtaining your translation authorization. May God protect us all. LA MULTI ANI, SORA DRAGA! SFANTA MUCENITA MARINA SA TE PAZEASCA, SA TE INTAREASCA IN DREAPTA CREDINTA SI SA TE BINECUVINTEZE, IMPREUNA CU FAMILIA TA! Multumesc mult pentru urari Adrian. Doamne ajuta pe toti! Nice pic of your two boys, hope the business(s) are going well for you? I live in Sydney, Australia and have a family of my own. The reason for this contact is for my father, who doesn’t know I am sending this email. My father was born in Tarna Mare (Transylvania) on January 6, 1925. His name then was Jakab Ferenc, and I believe he was part of a large family of at least 4 sons and 1 daughter. During the war he fled, and has never been able to find or contact other family members. He thinks an uncle may have gone to Canada around the time my father came to Australia, in 1950. Buna, Marina. Imi pare atat de bine sa „aud” de tine. Chiar astazi am cautat informatii la SNSPA despre obtinerea diplomei (desi au trecut asa multi ani) si cautand ceva pe net, am dat de blogul tau. Sa iti traiasca copiii! Mi-ar face mare placere daca ne-am auzi, macar on-line sa mai depanam niste amintiri. Cu mare drag, Constanta. La multi ani Marina ! Sfanta Mucenita Marina sa te pazeasca si sa te binecuvinteze! Nu de mult am dat peste acest site si vreau in primul rind sa te felicit Marina pt. acest blog ! Poate nu scriu la tema potrivita dar atit am inregistrat sa pot scrie ca am obosit. Vreau si eu sa depun actele pentru Autorizatia de traducator ocupindu-ma mult in ultima vreme de tot ceea ce inseamna engleza si chiar imi caut acum un job. Vreau sa te intreb Marina eu fiind dintr-o familie bilingva tatal meu e maghiar acasa vorbim numai maghiara mama rominca eu fiind de la gradinita la sectia romina , eu pot sa cer autorizatia si pe lb. maghiara dar neavind nici un document din care reiese ca eu de fapt vorbesc si traduc din in lb. maghiara. Iti multumesc si iti doresc multa sanatate copiilor tai si tie nu in ultimul rind.